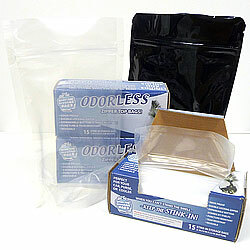 Plastic zip lock bags that hold all odor inside. Great for storing herb or cigars. These smell proof bags feature a double locking zip lock closure to ensure even the strongest of odors remain inside at all times. The Stink-in Storage Bags not only prevent smells from escaping they will also ensure no air or moisture enters, perfect for storing herbs as it will help to keep the material inside as fresh as can be for as long as possible. An expandable free standing bottom allows you to store an ample amount of material while standing upright, making an ideal choice for storing liquids. These innovative bags are derived from an extremely durable plastic material to promote conservation, allowing you to reuse each bag multiple times before needing a new one. Please note the tall size is only made available in the Clear color option and is sold in a pack of 4 while the small size can be purchased in either black (pack of 10) or clear (pack of 15). 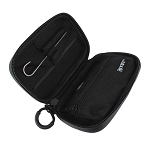 Bluntpac Mini Cigar Holders are so airtight that the cap makes an audible POP when removed! They are water resistant and smell proof and they even float. The Partypac is big enough to hold 4 cigarettes, coins,rolling papers or even a set of keys! They are water resistant and smell proof and they even float.